Welcome back to the the Cubs of Yore Battle Royale. 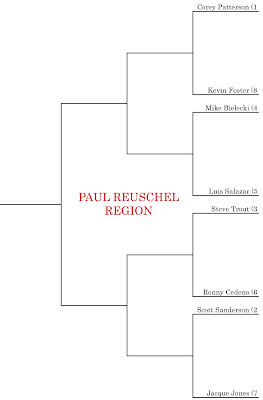 Today we finally wrap up the first round battles with the Paul Reuschel Region. Wait you mean Rick Reuschel right? Nope. I mean Paul. This final region has quite the mix of old and new, ranging from guys that played on the '84 team to guys that played last season. Here's how it works. I will outline each matchup, giving the readers a little background about each player. Once you've finished reading, you are then encouraged to vote for your favorite player to win the battle. Assisting me with the "Fast Facts" for this region is fellow bartender Dave Thomas. The battles will close sometime whenever. Results will be revealed later that day. Selected as the third overall pick in the 1998 draft. Was named the single A top prospect in 1999 and the double A top prospect in 2000. Blew out his knee in spectacular fashion against the Cardinals in 2003. Known for regurgitating the phrase “It’s just a game” time and time again. Cub fans are still anticipating his "break-out" season. Traded to the Cubs for Shawn Boskie. Played independent ball in the Northern League in 2003 and 2004. In 1995 led the NL in most home runs allowed with 32. Fellow Cub Steve Trachsel was second with 25. Played with Cubs for 4 years. Shares a birthday with Wesley Snipes and Tim Couch. Pedro Guerrero of the Cardinals robbed Bielecki of the first Cubs no-hitter in 19 years with a home run. Mike was a scant 8 outs away from history. Won a career high 18 games as a Cub in 1989. Traded to the Braves with Damon Berryhill for Yorkis Perez and Turk Wendell. Known to hang in the same social circles as Tommy Buzanis. Played every position in his career except catcher. Currently serves as the hitting coach for the Chattanooga Lookouts. Joined the Cubs in the final month of the 1989 season. Salazar hit .326 that September and helped the team win the NL East crown. Kept a large machete in his clubhouse locker. The last Cub to pitch back-to-back complete game shutouts, which were his last games with the Cubs. Helped the team reach the playoffs in the oft-heralded 1984 season. Was no stranger to the occasional burrito-eating contest. Played with the Cubs for 5 years. His hero is Jose Nieves. April 20th, 2007: Tagged out by David Eckstein after sliding past second base when Jacque Jones was walked. Cedeno commented with “must be new rules." Huge fan of mound conferences. Best remembered for nothing in particular. Played with the Cubs for 6 years. One of his two home runs was a game winning grand slam at Wrigley. Granted, he was an Expo at the time. Became an agent after retiring from baseball and has represented Frank Thomas, Josh Beckett, and Lance Berkman. TMS Bartender Dave Thomas got drunk in his basement when he was in high school. Caused Harry Caray notable distress when he suited up with Ryne Sandberg and Jim Sundberg. Played with the Cubs for 2 miserable years. Cheers - Tied his career best in home runs (27) his first year in Chicago. Jeers - Struck out 116 times his first year in Chicago. Claims to have signed with Chicago to play for Dusty Baker. Last played as a Cincinnati Red.... for Dusty Baker. *Some of the Fast Facts may not be true.